Adelaide - All-rounder Shane Watson is short of match fitness and will not be risked in the second Test against South Africa in Adelaide, Australia captain Michael Clarke said on Wednesday. Watson has been troubled by a calf injury and tried this week to prove his fitness after missing the drawn series opener in Brisbane earlier this month. But Clarke said doubts about Watson's injury prompted Australia go with an unchanged team for the second Test, which starts on Thursday. "He has improved a lot over the last few days... but is probably a few days short of being 100 percent," Clarke said. He added that vice-captain Watson would have time to get himself right for the third Test, which starts in Perth four days after the scheduled conclusion of the Adelaide showdown. "Once we got here, our intent was to give Watto every chance, as a very important player and vice-captain of the team but unfortunately we've run out of time," Clarke said. Senior batsman Ricky Ponting warned this week against playing a not fully fit Watson, saying it would place too much pressure on his teammates if he was used against the Proteas carrying an injury. 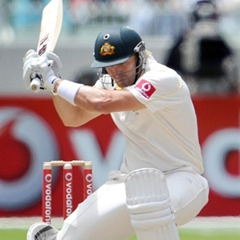 "No one can go into a Test match 70 percent fit," Ponting told reporters on Tuesday. "I don't care if you're a batsman and a slip fielder. If you can't bat at 100 percent, then you are putting pressure on other blokes as well." Rob Quiney, who made his Test debut in place of Watson in Brisbane, is expected to bat again at number three, while left-arm paceman Mitchell Starc remains the 12th man. Clarke said he and the selectors stuck with swing bowler Ben Hilfenhaus because of the improvement they witnessed from the bowling attack in the latter days of the Brisbane Test. "I thought the bowlers came back really well. We took 14 South African wickets where they took five of ours," he said. "I think we've got a good combination. We've got a good mixture of aggression but also bowlers who can bowl long spells and dry runs up if required out there on that wicket. "Generally in Adelaide, you have to bowl quite tight during periods of the game." Australia - Michael Clarke (captain), David Warner, Ed Cowan, Rob Quiney, Ricky Ponting, Mike Hussey, Matthew Wade, Peter Siddle, James Pattinson, Nathan Lyon, Ben Hilfenhaus, Mitchell Starc (12th man).